During the upcoming growing season you may need to fertilize your lawn or garden. You will probably want to add Nitrogen in some form on a consistent basis since it does not stay in the soil long. If you add Nitrogen in an organic form it will be slow-release so you don’t need to worry about adding too much. If adding Nitrogen in chemical form it is important to get the timing and amount correct. For all the other soil nutrients you should get a soil test to make sure there really is need – there is no point in spending time and money to apply something you already have. A soil test is also important to find out the PH – it needs to be in the right range for what you are trying to grow. Even if the nutrients are present, if the PH is not right the plants won’t be able to make use of them. Here is how to prepare a soil sample. Go to 10 to 15 places in your yard or garden and dig up consistently sized samples from the surface to six inches down. Collect the samples in a clean plastic bucket. Spread them out to air dry then mix together thoroughly. If you have distinct areas such as a lawn vs planting beds, prepare a separate sample for each area. You might want to do separate tests for the front or back yard, or sunny vs. shady areas also. Put one pint of each sample mixture into a clean plastic bag, label it with your name, address and sample location, and take it to a lab. For information about the University of Missouri Extension testing service, see their web site. This web page on the Missouri Botanical Garden web site will tell you how to utilize your test results after you get them. Impatient for home-grown greens? Try some sprouts! There are a lot of health claims associated with eating sprouts. I know for sure that they taste great and can be ready to eat just a few days after starting so if you’re ready for something green and yummy to eat you won’t have long to wait. 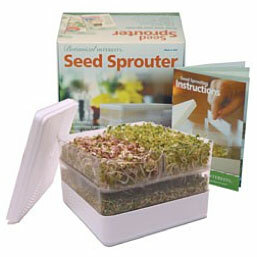 I purchased a Seed Sprouter from Schnarr’s and I’ll be giving it a try shortly. Schnarr’s carries some seeds from Botanical Interests that can be used for sprouting. We might not have everything listed on the Botanical Interests web site but we have some of them. You can also get seeds for sprouting from the Whole Foods bulk section. Did you know you can let some of your seeds grow two or three weeks past the sprout stage and cut the tops off to use them in juices or smoothies? Wheat Grass and Oat Grass work well for this because they are easy to grow indoors and they germinate pretty quickly. When they are long enough you can use them in your favorite recipe. I sowed my seeds in seed starting potting mix, harvested a first cutting and got a second smaller cutting off of them later before turning them over to my pet birds. Apparently European Starlings don’t need to be told that sprouts are good for you! They rapidly ate the stems, leaves, roots, and still-attached seeds with gusto! I think I remember reading somewhere that if you observe birds pulling up young seedlings in your garden, they are not just engaging in wanton vandalism, they want the extra nutrition from the sprouts. My own birds’ instinctive behavior around sprouts would seem to reinforce that idea. 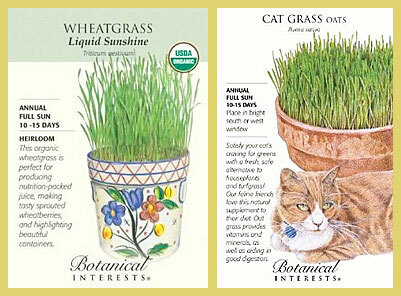 The Oat Grass is mainly marketed for cats while the Wheat Grass is marketed for human consumption. Both are nutritious for humans but the fibers are not digestible for us. You can get some of the nutrients from wheat and oat grass in a smoothie by thoroughly chopping the grass in a blender with the liquid that is going to go into your smoothie. Then strain the grass pieces out of the liquid and discard the fibrous parts. (I left some pieces in one of my smoothies as a test and I did not notice any digestive upsets but some people might not react well to the fibers). I don’t have a juicer and I’m not familiar with how they work but Wheat Grass is more commonly known for use with juicers. According to the website WebMD, Wheat Grass contains vitamins A, C and E, iron, calcium, magnesium and amino acids. WebMD states that there is not enough evidence to support most health effects other than nutrition although people do attempt to treat some health conditions with it and rates it LIKELY SAFE consumed in food amounts. WebMD has no listing for Oat Grass but other web sites I looked at state that it is also nutritious for people though perhaps not as much as Wheat Grass. Here is a delicious smoothie recipe to try. Blend milk and grass pieces together in blender until well chopped. Strain grass pieces out of milk with a fine strainer. Return milk (now with a green tint) to blender and add all other ingredients. Mix well until smooth. Enjoy! The following seed starting tips come from my Master Gardener class and are general for a wide variety of seed starting. Some of the information you may need to germinate seeds is specific to the type of plant you are trying to grow. 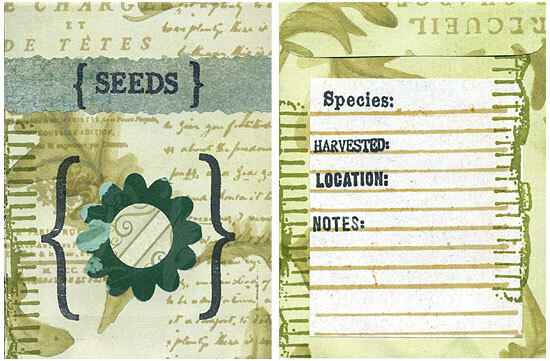 Check the seed packet or other resource to find out if there are any specific instructions for that particular seed. 1. Choose a seed starting mix that is loose or lightweight, porous, fine-textured, holds water, and is free of pathogens or weeds. It can contain fertilizer but doesn’t necessarily have to. 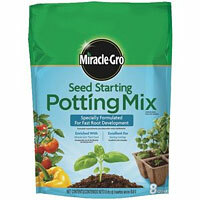 Pre-made mixes like the Miracle Gro Seed Starting Potting Mix* are easy to use. You could also make your own blend containing some or all of the following – peat moss*, perlite*, vermiculite*, compost and bark. Do not use field soil or sand. 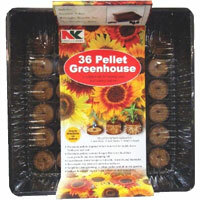 Peat pellets* can also be used in place of loose medium. 2. Next select a container. It can be a plastic container with drain holes* in the bottom or a plant able pot* made of biodegradable material. If you have used the container before it’s a good idea to soak it in a 10% bleach* plus water solution and scrub it to make sure it doesn’t harbor pathogens. 3. Fill the container to the top with planting medium without packing it down. 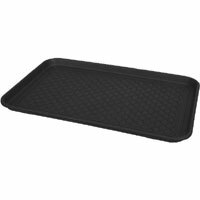 Set the container in a tray* of water and let the water soak through from the bottom up. The reason for watering from the bottom is to avoid packing down the planting medium. If you are using peat pellets soak them in water until they expand. 4. Dig little holes or trenches in the medium at the proper depth for that particular seed. 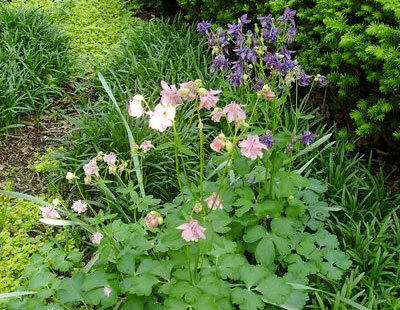 If you are not sure plant it at about twice as deep as the diameter of the seed (3-5 times outdoors). Cover seeds with medium. 5. If the container comes with a clear plastic cover, put the cover on. If you don’t have a cover, use a clear plastic bag and seal the bag to keep in moisture. You shouldn’t need to water for at least a week or so, unless you see the medium looking light colored and dry around the edges. When you do water the seeds, do a thorough job. 6. Place the seeds in a warm spot or on a seedling heat mat* until they sprout. 75 to 80 degrees is a good temperature range unless your seeds have other requirements. After that you can remove them from the heat source and remove the plastic covering. Keep seedlings away from a draft or heat vent. 7. Some seeds need light to germinate but for other seeds you can wait until they sprout to put them under lights. Some light from a window is helpful but it won’t be enough by itself. Artificial light can be either fluorescent or incandescent but you might prefer the fluorescent because it does not give off as much heat. The lights need to be very close to the plants and there is less danger of overheating the plants if you use a light that doesn’t get too hot. Warm and cool also can refer to light color and that is important to mention here. Plants use both red and blue light wavelengths for photosynthesis so you can use either warm or cool light or both together if you want. You don’t need special grow lights but if you see any that are meant to simulate a daylight spectrum those are a good choice. The brightness of the light, or lumens is more important than the color of the light, or kelvins. We have a wide selection of bulbs at Schnarr’s – talk to us about your lighting needs and we’ll help you select the right product. 8. 3-4 weeks after seeds have sprouted, you can start adding liquid fertilizer* at 1/2 strength. Check the Schnarr’s Calendar for suggested St. Louis area planting times, we have many plants listed on there. Stay tuned for future tips for transplanting the seedlings!